Based on preliminary data, the state-wide average precipitation for September was 7.98 inches, making this the third wettest September on record (going back to 1895) for Illinois. The all-time record is 1926 with 9.71 inches while second place goes to 1911 with 9.06 inches. Chicago (at O'Hare airport) reported 6.64 inches on September 13, setting a new record for the most rain in one calendar day in Chicago's history. The old record was 6.49 inches on August 14, 1987. Chicago climate records date back to 1871. 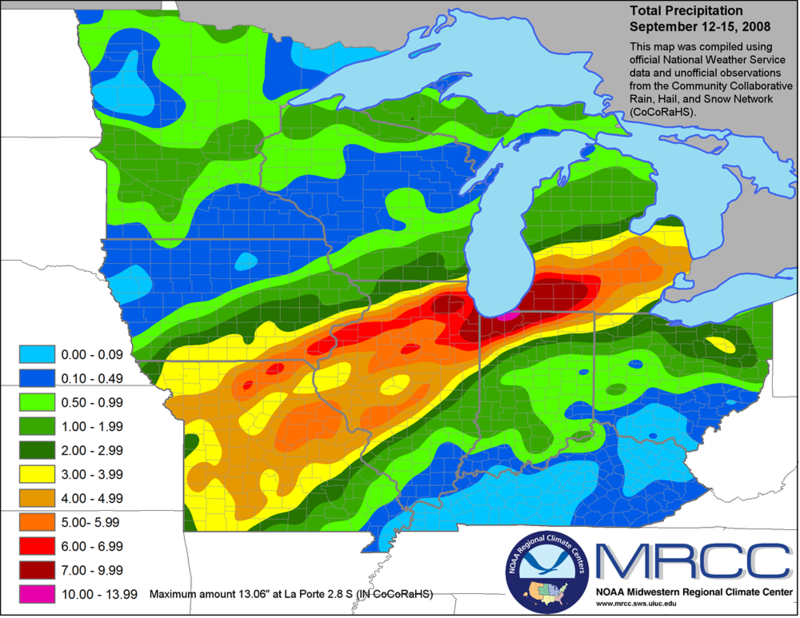 Illinois experienced a one-two punch of a nearly stationary cold front positioned in northern IL on Friday and Saturday that produced considerable rainfall amounts on already saturated soils. Additional rains fell on Sunday from the remains of Hurricane Ike. This system was a category 2 hurricane in the Gulf of Mexico before it struck the TX coastline. From there it moved northward, following along the cold front and through into IL as a tropical depression. 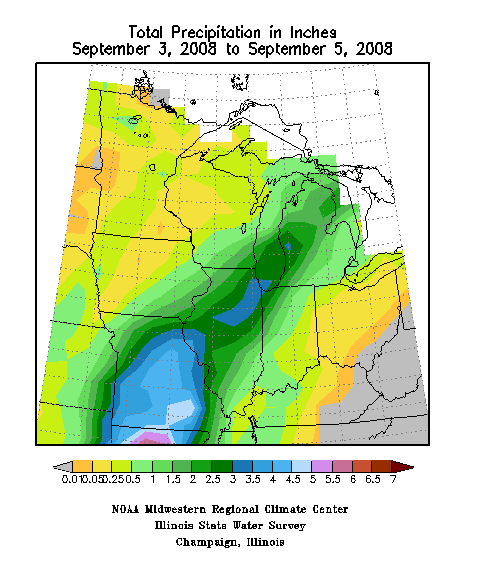 Amounts of 4 to 10 inches were common in central and northern IL from the three days of rain. Click on map to enlarge. Considerable flooding was reported, especially in Chicago. 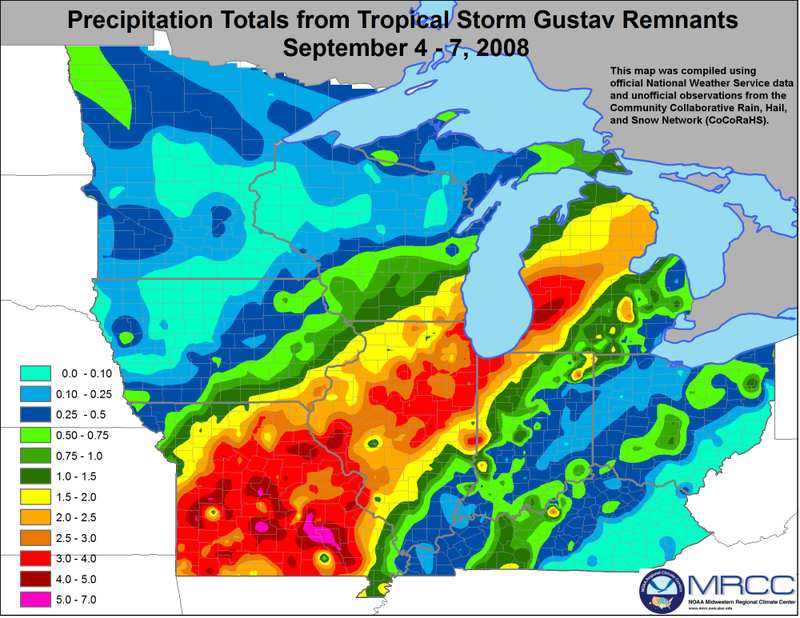 After an exceptionally dry August (see previous entry), the remains of Hurricane Gustav delivered needed rains across Illinois. Most areas of the state reported between 1 and 4 inches of slow, steady rain from this system as it made its way through the state. Most of this rain fell in the evening of September 3 and all day on September 4. This system was a category 4 hurricane in the Gulf of Mexico before weakening as it struck the Louisiana coastline. From there it moved through AR, MO, and into IL as a low-pressure system. Click on map to enlarge.